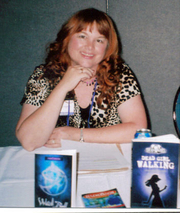 Author of THE SEER series (6 books plus short story at www.LindaJoySingleton.com ), DEAD GIRL trilogy, STRANGE ENCOUNTERS series and 2012 spin-off from THE SEER starring Thorn. Linda Joy Singleton's book Never Been Texted was available from LibraryThing Early Reviewers. Linda Joy Singleton is currently considered a "single author." If one or more works are by a distinct, homonymous authors, go ahead and split the author. Linda Joy Singleton is composed of 6 names. You can examine and separate out names.